I went up to Bryn-Bach Common this evening for another attempt at photographing the Yellowhammers, but they were sadly absent. I did however see my first patch Swallows and Sand Martins and what I believe may have been a Tree Pipit. Rather foolishly I hadn't taken my binoculars with me though so I cant be sure of the id. Other birds seen included numerous Meadow Pipits and Linnets but all were keeping their distance. Instead I turned my attention to the Bracken that is suddenly shooting up across the common. 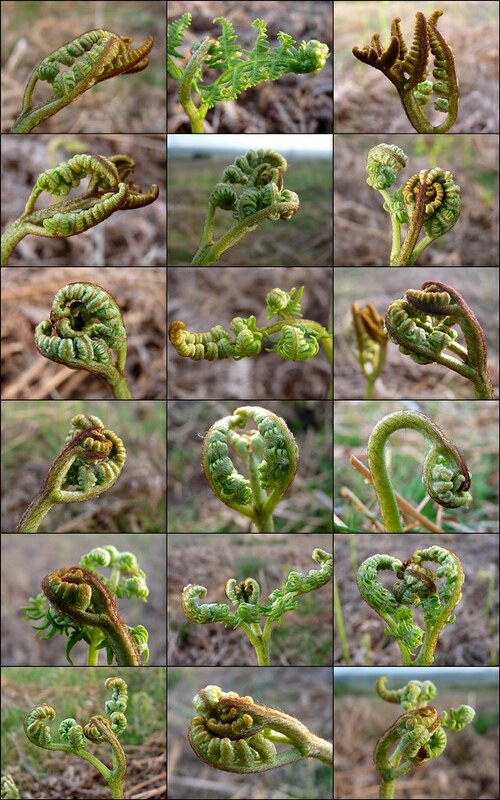 I have always found the shapes that the unfurling fronds make fascinating, so decided to try and capture as many as I could and turn them into a collage. If you want to see the beauty of nature at its best then there is no need to look further than the humble Bracken.